As humans, we tend to be hard on ourselves. When we make mistakes, we dwell on them, dredging them up, and remaining ashamed — often long after others have forgiven us and moved on. The same is true of our money mistakes. It’s all too easy to get caught up in what we’ve done wrong, and find ourselves dwelling on the things we’ve done wrong with our money. Unfortunately, this tendency can hold you back. If you are ashamed of what you’ve done with your money in the past, it’s a good idea to let go. Constantly dwelling on your mistakes can put you in a negative state of mind, and also cultivate feelings of helplessness. These feelings of helplessness can, in turn, prevent you from trying to improve, since it often results in a “why bother” mentality that isn’t conducive to actually changing things. You need to move on from those mistakes, and live better. While you do need to fix the financial problems in your life, and make plans so that these mistakes aren’t repeated, you also don’t want to let those mistakes hold you back to the point where you are so ashamed that you are unable to move forward and make better decisions for the future. The first step to getting over your money shame from the past is to recognize your financial weaknesses and strengths. We’ve all made mistakes. I’ve made mistakes in the past myself. Dwelling on those mistakes won’t turn things around for you, though. Instead, you need to use those mistakes to better yourself. Acknowledge the money mistakes you have made, and then look for the weaknesses that led to the mistakes. Recognize these problems so that you can fix them, and move forward. But don’t just take stock of your weaknesses. You should also consider your strengths. What can you do to improve your situation? Look at the things you have done right, and recognize how some of your good decisions have benefitted you. Then, focus on how you can change your habits so that your money weaknesses no longer have a hold on you. Use your financial strengths to help get you on the right track so that you have something positive to think about as well. Few of us can overcome our past money mistakes without help. This is especially true if you are paying off large amounts of debt. Look for support from people who care for you, and who are willing to provide you with encouragement. Good friends won’t keep harping on your past mistakes. As you work to overcome your problems, look for people who bring out the best in you, and are willing to support you as you work toward your goals. Try to avoid people who will keep reminding you of your missteps, and who seem to delight in making you feel bad about the past. If the goal is to move forward and improve your life and finances, you will need the right kind of people around you. One the best ways to leave your money mistakes in the past is to create a roadmap you can follow. A plan of action will take your forward, and when you have a purpose for your money, it’s much easier to avoid falling back into the traps of the past. Do yourself a favor and put together a financial roadmap that can bring you to the point of financial freedom. This means that you will need to take the self-analysis from step one, and apply to your current and future situation. One of the great things about this approach is that you look at where you are right now, and then consider what needs to be done in order to take you from your current point to your future goals. This doesn’t involve dwelling on past financial indiscretions. Once you acknowledge your mistakes, and figure out what you can learn from them, it’s time to leave them in the past and move forward. You’ll be much happier with your financial situation, and you will be able to put yourself in a position to succeed in the future. Thanks for your post! You gave some good thoughts that are applicable in many areas of life. Good stuff! It’s so important that we don’t let our past determine our future. Just for fun, I’ll talk about the flip-side. Another side to this, sometimes, is putting your successes in the past. For example, I knew a real estate agent who sold several million dollars in one year. He was a millionaire after about 3 or 4 years of selling like this. One day, the value of farm land in that area plummeted. He wasn’t too great at managing his money and he ending up going broke, sadly. His big problem after going broke was that he felt, since he used to be a millionaire, that working a “regular” job would be beneath him. I mean, come on, he used to be a millionaire, he can’t work for $10 an hour, right? Well, he ended up becoming homeless for about 2 years before he finally realized that his pride caused it all and he finally learned to do whatever it took to make ends meet until he was able to start selling real estate in another area. Now he is wealthy again, not a millionaire, but wealthy. Just throwing another side out there. 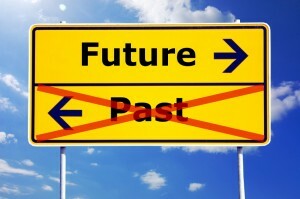 You’re spot on with leaving your past behind! I see so many people dwell on mistakes, but then learn nothing from them. I always try to find the lesson and move forward without beating myself up too much. Great advice. If you look at your past to learn from it but then move on, that’s enough. Create a new past based on what you are doing today. You can change history! It’s not how many times you fall down, it’s about how many times you get back up. Learn from your mistakes, and move on.